You can receive your St Kitts calls at any phone, mobile or fixed line, in any country. Do you have family members, friends, or business contacts in Saint Kitts and Nevis? Do they hesitate to call due to concerns about international calling costs? Overcome those concerns by getting a toll free virtual phone number for Saint Kitts and Nevis. Our no-contract virtual phone plans allow you to pick a monthly allotment of minutes each month for a low rate. For example, as of this writing, you can get more than two hours of talk time for less than $50. Larger buckets of minutes are also available, a terrific option if you run a business in Saint Kitts and Nevis or anticipate a month with a higher call volume. Optional rollover minutes provide you with even greater flexibility. Once established, your Saint Kitts or Nevis contacts can dial a toll free number to reach you anywhere in the world. The toll free virtual number works throughout Saint Kitts and Nevis and is mobile accessible. 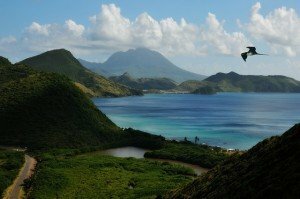 Though your destination phone may be located in another portion of the world, the virtual number is specific to the Saint Kitts and Nevis region. Your callers will not need to dial an international exit or country code, nor will they require operator assistance in order to reach you. Meanwhile, their phone calls will be routed over a fiberoptic PSTN network to your designated “ring to” number. You can receive your St Kitts calls at any phone, mobile or fixed line, in any country. Best of all, you callers will not incur any costs associated with the phone call. This is particularly reassuring if you have a college student studying abroad or elderly relatives living in Saint Kitts. If you have clients, customers, or business associates in Saint Kitts and Nevis, giving them a toll free virtual number is a smart business decision as the toll free number will remove any obstacles to calling you as well as help your business appear more professional. For example, our toll free virtual phone number plans for Saint Kitts and Nevis include advanced features like automatic voice response and sequential forwarding. You can set up a virtual PBX to greet callers and route them to the appropriate extension. You could set up backup ring-to numbers to ensure that your calls are promptly handled by a live person. You could even set up select country call forwarding so that all incoming calls from Saint Kitts and Nevis are consistently directed to the appropriate extension. Whether you have a large call center or a small customer service department, consider activating the optional call recording feature which automatically records all incoming calls. This is a great way to improve service or enhance training. How are you using your St. Kitts virtual phone number in your personal or business life?